Chris Christie on climate change: New Jersey governor says global warming is real, and that humans contribute to it. Christie Says Man-Made Climate Change Is Undeniable. What’s He Going to Do About It? New Jersey Gov. 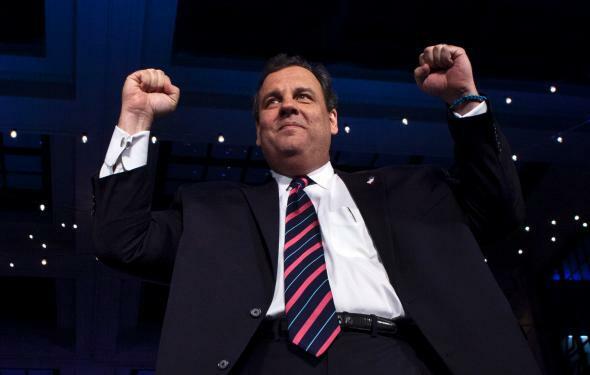 Chris Christie arrives to speak at his election night event after winning a second term at the Asbury Park Convention Hall on November 05, 2013. He added, however, there needs to be more discussion about the degree to which humans play a role. … Christie stressed, however, that when it comes to curbing climate change, the United States or a group of states “can’t be acting unilaterally” especially “when folks in China are doing things to the environment that we would never be done in our country …There’s no use in denying global warming exists. The question is what we do to deal with it.” Christie also expressed skepticism about cap and trade programs. Those caveats come from the same messaging playbook that Senate Republicans used during this year’s Keystone XL vote, which they used to blunt Democrats’ charges of full-on climate change denialism. By acknowledging that human’s contribute to climate change, Christie is staking out a position that is closer in line with the scientific consensus than rivals like Marco Rubio and Ted Cruz (both of whom have refused to concede humans play even the slightest role in it), and one that is somewhere in between that of Rand Paul (who says man plays a role, but not a significant one) and Lindsey Graham (who says man’s role is signficant—and the government should actually do something to address it). Christie’s comments came in response to a question from the crowd, so it remains to be seen if he’ll be willing to force the issue to the same degree as Graham. If he does, it would make him more appealing to those moderate voters who prefer their politicians come with at least a patina of climate sanity, and may even make things awkward for more center-right candidates like Jeb Bush, who has largely avoided the topic other than to say he is “concerned” about global warming. Unfortunately, though, it would be unlikely to have much of an impact on most of his rivals who are running as far to the right as they can to lock up the conservative base.